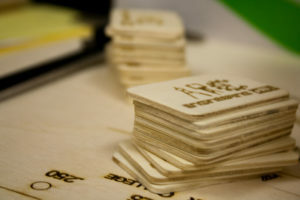 Jair and three other Design Hub interns worked together on a laser engraving project. This project was ordered from the Engineering Club and Randy Schuster, who is the advisor for the Engineering Club. Using the Design Hub’s laser engraver they were able to accomplish this project. 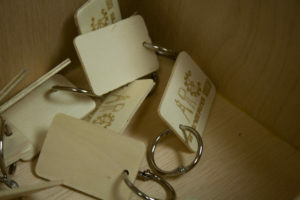 The Keychains were engraved with the logo, also known as SWAG. It was engraved in plywood, and hooked with a metal chains that is attached through the little hole on the side of the keychain. 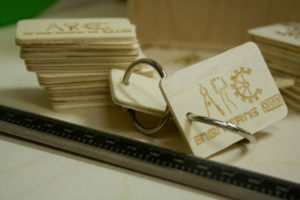 These keychains were going to be given away for free for the Engineering Club students. In the future, bobbleheads will be made to donate. The interns are working on the bobblehead project at the same time as the keychain project, and it will involve scanning and 3D printing of participants’ heads. Scanning will take a couple of hours, whereas the 3D printing is estimated to take one to two days.